Here’s another fundamental principle of SourcePoint Therapy: good health=good communication. In SourcePoint we are opening up our communication with that larger field of information in which we dwell. We are opening ourselves to the information of order, balance, harmony and flow inherent in our bodies, our earth and our universe. We live in a universe that is constantly communicating with itself. Physicists describe an interactive and entangled universe. Quantum entanglement means that particles of energy/matter, separated by vast distances, can interact with each other instantaneously, in a communication that is non-local and not limited by the speed of light. To quote the Buddha once again, “In this fathom-high body is the entire universe, and its arising, and its ceasing.” Take a look at the video below. Within this body, inside the brain, there are billions of neurons in constant communication with each other, creating billions of neural pathways. When I see these energy connections in videos such as this one, I think, ah, there’s the Mandala Realm again, a web of energy and light, point and lines. As above, so below. Microcosm mirrors macrocosm. This self is a network of energy patterns forming and re-forming, dancing in endless beauty and creativity. The neurons in my brain have billions of “welcome receptors” and when those receptors receive a message, they can create instantly up to 50,000 connections with other neurons, passing the message along. My self is constantly communicating with itself, and I can easily imagine that network of pathways extending itself beyond the physical body into my immediate energy field, out into the farther reaches of the galaxy. Then I can begin to understand that the self that is communicating with itself extends far beyond the boundaries of this physical body. If I reflect on this communication that is going on in my brain every single moment, and I see that process as a mirror of the communication that is always happening in that larger information field, then I get another insight into what is happening when we hold the points. It’s hard to put into words, and I’m going on imagination here. I’m imagining holding that Source Point off to the right of the body. My mind, through my hand, is transmitting the message to that point that we want to connect with information of health in the universal information field, so the point is perhaps like a synapse, and the message travels along a network of points, and each point sends the message to the next point, until it reaches its destination, in a moment of split-second-beyond-time non-travel, and then the information travels back as instantaneously along whatever network is set up for it. I’m imagining the universe as a vast brain, I guess, or even more accurately, a vast body. And in that vast body communication is always happening as that universe-body seeks to maintain the balance, order, harmony and flow of all its parts. Rupert Sheldrake speaks of “nested hierarchical fields,” field within field within field, body within body within body. 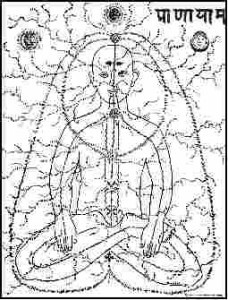 Ervin Laszlo says, “The physical world is a reflection of energy vibrations from more subtle worlds that, in turn, are reflections of still more subtle energy fields.” As the ancient seers in India knew, the nadis, or energy channels, both permeate and surround the body (see image above). So, it is not just that we live in a great flow of communication and information; each one of us is a flow of communication and information. In our personal lives many of us have discovered that an open flow of communication is important for the health of our relationships and our communities. It’s equally important for the health of our physical bodies. Next week I’ll look at some “down to earth” implications of this. This week, join me in traveling to the furthest reaches of your imagination, letting yourself journey through the cosmos and deep into yourself”¦with the growing understanding these are not two. Once again, I’m convinced the imagination is a powerful means of exploring and understanding this wondrous self, world and universe. If I could, I’d eliminate the dismissive phrase, “Oh, it’s just your imagination” from everyone’s vocabulary. I said I’d talk next about intention. I am not so good at sticking to announced agendas. I promise I will spiral back within the week to talk about it more fully. However, any talk about intention in SourcePoint Therapy needs to be grounded in experience of and connection with the blueprint. That information of order, balance, harmony and flow is, in its nature, focused and intent. In SourcePoint our intention is to connect with the intention that is already there! Maybe deep intention isn’t a creation of our human minds, maybe it’s alignment with the intention of the energy-information field we are connecting with through the source point. So let’s immerse ourselves a little longer in that field. Take a look at the video we’ve posted. It’s all about how form evolves from dots and lines, and how the blueprint we talk about is not a fixed, static pattern, but one that is constantly re-forming itself from its elemental structures of dot, line, and wave, to name a few. The video is a visual metaphor for the dance of pattern/information we call the blueprint. It’s a basic premise of SourcePoint Therapy that form emerges from these energetic patterns. Sometimes this can sound abstract and impersonal. It isn’t. Those dots and lines, ribbons and waves, shapes and sounds, geometric patterns, are pulsing, living, vibrant realities. When Bob and I talk about this dimension, it’s not just words to me. I see it, feel it and dwell in it for a time. It’s as real as you, me, or the chair I’m sitting on. It is you, me and the chair I’m sitting on! We’re a part of it; it’s a part of us. As we talk about the blueprint we enter the field of that healing energy, light and information. The more time you spend with the blueprint, feeling it, imagining it, discussing it with others, exploring the concept, playing with pattern and mandala, the more that connection to the blueprint gets established for you, and the more established it becomes, the more you feel its support. It reminds me of Indra’s Net, a metaphor used in the eastern traditions to describe the nature of consciousness and the universe. Imagine a net extending in every direction, with a mirror at every corner of the net. Every one of those mirrors at every corner is connected to and reflecting to every other mirror. I like to think of the field of energetic pattern that contains the blueprint as the “Mandala Realm.” The root meaning of the Sanskrit word mandala is “containing the essence.” Mandalas have been used in virtually every culture for healing and meditation, ceremony and ritual. What if mandalas are not creations of the human mind, but rather reflections in the human consciousness of patterns that exist in what physicist Ervin Laszlo calls the Akashic Field? Ceremony and ritual utilizing mandalas have traditionally been performed to maintain and restore balance, order, harmony and flow in this plane of existence by connecting to the order, balance, harmony and flow of the greater cosmos. At this juncture in human history when traditional religious and cultural forms are changing it’s important to find new ways to connect to that information of balance, order, harmony and flow. We need a deeper connection to and understanding of the blueprint and the larger field we are calling the Mandala Realm. Like Laszlo says, we have to apprehend our “informed universe” with our hearts as well as our brains and, I would add, our imaginations as well as our intellects.